24-Zig along the Burma Road （滇缅公路24拐）, in Qinglong, southwest Guizhou prov. “Currently, Guizhou is investing heavily in a campaign to buildnew roads. However, we will preserve the “24-zig” according to itsoriginal look,” said Zhou, adding that “it is a relic of World War II, and a symbol of Sino-American friendship”. Lin Kongxun, 80, a former interpreter with the US 1880 engineerbattalion stationed along the “24-zig”, said that the road was so dangerous many trucks overturned. “Whenever the US drivers got onto the road, they prayed to God,” said Lin, a professor from the Huanan Agriculture University. But it was the terrible, unforgettable road that guaranteed final victory in the war against the Japanese, he asserted. Guo’s rediscovery of “24-zig” has amazed the world. Guo and Lin believe that the road will serve as an emotional link between China and the United States in the 21st century. “I hope people from different countries will return to the road to remember its history, just like the reunion of surviving Chinese and US pilots in Beijing in May this year,” Guo said. Before the India-Burma-China road was constructed, all strategic materials had to be carried into China by air. A total of 468 US planes crashed when crossing the Himalayas, killing 1,579 pilots. Lin said a reunion of veterans of the 1880 engineer battalion was held in 1986. “After the gathering, I received a lot of pictures and reports about the Stilwell Road mailed by my American friends,” he said. It used to take 18 days to go from Guiyang to Chongqing ! A famous Chinese archaeological writer Bin Yang, whose work, ‘Between Winds and Clouds; The Making of Yunnan’, published in 2004 by the Columbia Universitypress and some earlier writers and archaeologists, such as Janice Stargardt strongly suggest this route of international trade as Sichuan–Yunnan–Burma–Bangladesh route. According to Bin Yang, especially from the 12th century the route was used to ship bullion from Yunnan (Gold and Silver being among the minerals in which Yunnan is rich), through northern Burma, into modern Bangladesh, making use of the ancient route, known as the ‘Ledo’ route. The emerging evidence of the ancient cities of Bangladesh, in particular Wari-Bateshwar ruins, Mahasthangarh, Bhitagarh, Bikrampur, Egarasindhur and Sonargaonare believed to be the international trade centers in this route. photo: The Guizhou-Guangxi Railway near the Layi Station in Nandan County, Hechi, Guangxi. The Guizhou-Guangxi Railway or Qiangui Railway (simplified Chinese: 黔桂铁路; traditional Chinese: 黔桂鐵路; pinyin: qiánguì tiělù), is a single-track electrified railroad in Southwest China between Guiyang in Guizhou Province and Liuzhou in Guangxi Zhuang Autonomous Region. The shorthand name for the line, Qiangui, is derived from the shorthand names of Guizhou (Qian 黔) and Guangxi (Gui 桂). The railway was originally built from 1939 to 1958 and had a total length of 607 km (377 mi). From 2004 to 2009, the line was rebuilt to add tunnels and bridges in place of switchbacks over mountainous terrain and reduced in length to 489 km (304 mi). Travel time between the two terminal cities has been reduced from 14 hours to 5 hours. Major cities and towns along route include Liuzhou, Liujiang, Liucheng, Yizhou, Hechi, Dushan County, Duyun, Guiding County, Longli County, and Guiyang. The Qiangui Railway is a major rail conduit in western China from Baotou in Inner Mongolia to Gulf of Tonkin. Construction of the Guizhou–Guangxi Railway began under the Republic of China during World War II to provide the country’s wartime capital, Chongqing, with an outlet to the sea. In April 1939, with the Japanese invasion threatening Jiangxi and Hunan Provinces, the Chinese government chose to abandon construction of the Hunan–Guizhou Railway and shifted personnel southwestward to the Guizhou–Guangxi corridor. From September 1939 to February 1941, 161 km (100 mi) of track was laid in the plains from Liuzhou to Jinchengjiang (Hechi). The 237 km (147 mi) Jinchengjiang to Dushan section was completed by May 1943, and gave rail access to the airfield at Dushan. Dushan served as a base for the Flying Tigers and reception point for the allied air shipments over “the hump” from India. The Qiangui Railway was used to redistribute supplies to southern Guizhou and Guangxi. Pilots shot down and rescued in rural Guangxi and Guizhou were sent to stations along route and transported by rail back to Dushan. On the electrified and rebuilt section of the Qiangui Line between Yizhou and Hechi. Over 200,000 workers were mobilized for the project in Guangxi and 30,000 in Guizhou. Over 2,000 workers died of disease and accidents. Work on the final section from Duyun to Guizhou was halted in 1944 with the Japanese Ichi-Go Offensive. In November 1944, the Japanese captured Liuzhou and proceeded to travel up the railway to attack southern Guizhou. The Chinese forces defending Mawei, Dushan and Duyun proceeded to destroy the railway and train cars. After the Japanese surrender in 1945, the Republican government began to repair the sections damaged by the war. The Chinese Civil War intervened and by 1949 only the Liuzhou-Jinchengjiang section had been restored. After the founding of the People’s Republic of China in 1949, the new government removed rails from 300-km unrepaired section from Jinchengjiang to Qingtaipo to build the Hunan–Guangxi Railway. Construction on the Jinchengjiang to Duyun section of the Guizhou–Guangxi Railway resumed in 1955 and was completed in 1958. The entire line officially opened on on January 7, 1959. Aside from the Guiyang to Guiding section which had double-track, the rest of the line was single track. Due to the mountain terrain and steep inclines on the line, average travel speed on the line was limited to 41 km/h (25 mph) for passenger service and 21 km/h (13 mph) for freight. From December 2004 to January 2009, the railway underwent reconstruction to expand capacity. The Luoman (Liujiang) to Jinchengjiang section of the line was largely rebuilt. Entirely new lines were built between Jinchenjiang to Longli and between Liuzhou and Luoman. The Liuzhou to Longli section was electrified. As a result, the length of the line was shortened by 118 km (73 mi). Travel speed rose to 160 km/h (99 mph) between Liuzhou and Jinchengjiang and between and 140 km/h (87 mph) between Jinchengjiang and Longli. Four trunk lines radiate from Guiyang, the capital city, to neighboring provinces with a total mileage of 1,468 kilometers. Electrification transformation has been completed along the Guiyang-Kunming, Sichuan-Guizhou and Hunan-Guizhou railways, which means 1,138 kilometers out of 1,468 kilometers are under electrified operation. This change has raised transportation capacity by 100 percent. Guizhou is a key area for railway construction in the country. So far, the section of 227 kilometers within Guizhou Province on the Nanning-Kunming Railway has been launched into service. Construction of the second electrified track of the Shuicheng-Zhuzhou Railway which will include 596 kilometers running through Guizhou and which is to be the largest east-west transportation line in the country is soon to begin. Construction for the Shuicheng-Boguo and Huangtong-Zhijin railways with investment by both the central and local governments will also begin very soon. Once completed, these transportation archeries will further elevate Guizhou¡¯s position as a major transportation pivot in southwest China, and benefit the economic development not only in Guizhou but also in neighboring Sichuan and Yunnan provinces. In 1998, there were 33,604 kilometers of inland waterways in Guizhou with a transportation job of 3.15 million tons completed. This was 42.5 percent over the figure of the previous year. By 1998, air routes had been opened to link up Guiyang with 26 cities including Hong Kong, Beijing, Guangzhou, Shenzhen, Shanghai, Chengdu, Chongqing, Kunming, Guilin, Xiamen, Xian, Haihou, Changsha and Wuhan. The Longdongbao Airport, the newly completed large airport in Guiyang, was launched into service on May 28, 1997. Guiyang’s train station is located near the heart of the city. As the station is SW China’s main hub, everyday there are about 100 trains that go to hundreds of cities in the area and all around China. (full list of Guiyang departures) Guiyang is a major stop that connects the east to Kunming (12 hours, about 130 yuan hard sleeper), the west to Guangzhou (30 hours, about 350 yuan hard sleeper) and the North to Chengdu (16 hours 170 yuan hard sleeper) and Chongqing (8 hours 100 yuan hard sleeper). There are no direct trains from Guiyang to Guilin but you can get to Hunan through Kaili. There is even a direct train from Guiyang to the island Hainan that transports you by boat (sleeper 300 yuan). To buy a ticket one must be able to speak basic Chinese, come pre-prepaired with your written itinerary or use one of the ticket machines at the train station. You can buy a ticket at the train station starting 10 days prior to your departure. Throughout the city there are also small ticket booths where you can buy tickets for an extra 5 yuan. The most prominent one is located inside the Postal Savings bank across the street from Pizza Hut in Peng Shui Che. Upon entering the city you can either take a public bus or a taxi. Across the street from the train station you will see many buses lined up. Bus 1 and 2 will take you to the center of the city. After the buses near the train station hotel there is a line for metered taxis. That being said taxis can be difficult to get, especially if you want a meter at night. Beware if you are foreign taxi drivers will try to overcharge you. A metered taxi in Guiyang starts at 8 yuan and goes up after you reach 2 km. If you can get a taxi to go to where you need to go for 10-15 yuan take it. Guiyang is a railway hub in southwest China. The Guizhou–Guangxi Railway (built in 1959, modified 2009), the Sichuan–Guizhou Railway (completed 1965), the Guiyang-Kunming Railway (completed 1970), and the Hunan–Guizhou Railway (completed 1975) are intersecting in Guiyang Railway Station. This main southern railway station is being rebuilt in 2008. There are four high-speed rail lines to and from Chengdu, Chongqing, Guangzhou, Kunming, and Changsha and that will commence operations within the next few years. The high speed railway lines will provide rapid freight service from two rail yards, and passenger service from a new high-speed railway station, called Guiyang North Railway Station, in the city’s Guanshanhu District. Now main bus station for Guiyang. In Jinyang area 45 minutes to the northwest of Guiyang city center. Guiyang has one major long-distance bus station in Jinyang. The long-distance bus stations are also the best location to get buses to Anshun (60-90 minutes), the gateway to Guizhou’s signature Huangguoshu Waterfall. Buses north to Zunyi (two hours) depart every 30 to 60 minutes. Geography is what makes Guizhou so great but it also makes it hard to access. That is why the highway infrastructure in Guizhou is constantly undergoing repairs and upgrades. There are expressways to Chongqing, Zunyi and Anshun, Kunming and Kaili but they aren’t what you imagine when someone tells you it is an expressway. It is possible (although expensive, so it may be better to take the bus or train) to hire a car and driver between Guiyang, Zunyi and other cities starting at 500 yuan ($80) a day. Taxi’s in Guiyang start at 8 yuan for the first 2 km and increase by 2 yuan for every 1km after that. Taxis can be hard to find during rush hour especially on main roads, if you are having problems finding a taxi, try a smaller road. Also Guiyang has many black taxis. Most of the time these taxis work perfectly, but there have been a few cases of black taxi drivers either trying to rip-off foreigners or trying to commit even worse crimes, use them at your own risk. Public buses in Guiyang are cheap and extensive, but with larges amounts of people using them and Guiyang’s infamous traffic, they can sometimes be a pain to use, especially if you cannot get a seat. Below is a list of all the bus routes. You may click on the number to see where the bus goes, for how long and what to do/see at each station. The city is located at the junction of four major segments of the national highway grid: the Gui-Huang, Gui-Zun, Gui-Bi, and Gui-Xin Expressways. The Gui-Huang Expressway (G60) links Guiyang with the cities and tourist areas of central and western Guizhou including Anshun, Guanling, and the Huangguoshu Waterfall. The expressway continues west to Yunnan Province as the Gui-Kun Expressway and terminates at Yunnan’s capital city of Kunming. G75 Lanzhou–Haikou Expressway runs north 180 km (110 mi) to Zunyi and is the most heavily travelled major highway in Guiyang. In Zunyi, the expressway becomes the Zunyi-Chongqing Expressway and runs a further 210 km (130 mi) north to Chongqing. G76 Xiamen–Chengdu Expressway links Guiyang with the regional cities of Bijie and Dafang in northwest Guizhou province, southeastern Sichuan province, and the Sichuan cities of Luzhou, Neijiang, and Chengdu – Sichuan’s provincial capital. The Gui-Bi Expresway begins at an interchange with the Gui-Zun Expressway in the city’s Xiuwen County approximately 20 km (12 mi) north of the city center, before terminating at the city of Bijie. In the city of Dafang, approximately 40 km (25 mi) east of Bijie, the Gui-Bi Expressway connects with the new Sichuan-Guizhou Expressway, a modern highway providing access to Luzhou and central Sichuan. The Gui-Xin Expressway begins at the junction of the Guiyang Outer Ring Road (G75-G60.01) and the Tang Ba Guan Road, approximately 5 km (3.1 mi) southeast of the city center. The Gui-Xin Expressway (G60-G75) runs east and southeast through the Guangxi Zhuang Autonomous Region (G76), passing through Guilin, before entering Guangdong, and terminating at Guangzhou. Approximately 170 km (110 mi) east of Guiyang in the regional city of Kaili, the Hunan-Guizhou Expressway (G56-G60) links with the Gui-Xin Expressway providing high-speed vehicular access to and from Guiyang to the eastern Guizhou city of Tongren before continuing through Hunan to the major cities of Huaihua, Changde, and Changsha. In 2009 Guiyang added a modern orbital expressway to its highway network. The Guiyang Outer Ring Road (Guiyang Orbital Highway) opened in December 2009 and is a six- to eight-lane divided high-speed expressway that provides efficient links to and from large employment centers in the Jinyang New District, Baiyun District, Huaxi District, the Guiyang Longdongbao International Airport, the major multi-lane national highways, and the city’s main roadways, allowing vehicular traffic to circumnavigate the heavy traffic of the city’s inner city areas. The construction of the Guiyang-Guangzhou high speed rail has come to an end and its debugging is being carried out to make sure the line is put into operation by the end of the year, the Guiyang-Guangzhou high speed rail scheduling conference was told. It is expected that the standard speed of the Guiyang-Guangzhou line will be 250 km/h. With a total length of 857 kilometers, the high speed rail will start from north Guiyang, stopping at Longli, Duyun, Danzhai, Rongjiang, Congjiang, Guilin, Gongcheng, Hezhou, Zhaoqing, Sanshui and Foshan, to arrive at its terminal Guangzhou. There are 21 stops in total, and 8 stops among them are inside Guizhou province. After completion, the duration from Guiyang to Guangzhou will be reduced to only 4 hours, from as long as 20 hours before. Tunnels will carry more than 80 percent of the Guiyang-Guangzhou high speed railway. And for convenience, a 3G and 4G network will cover most of the tunnels. Guiyang-Guangzhou High Speed Railway is a major trunk route selected in the 11th Five Year Plan by the Chinese government. It will allow a fast link between the South-West Chinese provinces of Sichuan,Chongqing, Guizhou and Guangxi to the economic power houses of China in Guangdong and Hong Kong. It will allow for a massive reduction travel time between Guiyang and Guangzhou from 22 to 4 hours. The 857 km route of this railway is more direct than current routes. This is due to the exceptionally difficult and mountainous terrain, making this high-speed project very expensive to construct. Project cost is estimated at 85.8 billion RMB (USD$12.6 billion). This means 209 tunnels are required over the length of this route, some being in excess of 14 km in length. It will pass through the major tourist destinations of Guilin and Yangshuo in Guangxi province with its unique karst landscape. Construction commenced in 2008 and is expected to take 6 years to complete. More policies will be rolled out soon to encourage Chinese lenders to finance infrastructure in countries along the route connecting China to Europe, said the officials. They asked not to be identified as they weren’t authorized to speak publicly about the plans. Chinese companies will also be urged to invest in the countries and bid for contracts, the officials said. The New Silk Road plan, comprising a land-based belt and a maritime route, has been referred to as a Chinese national strategy after Xi first proposed the idea in Kazakhstan a year ago. 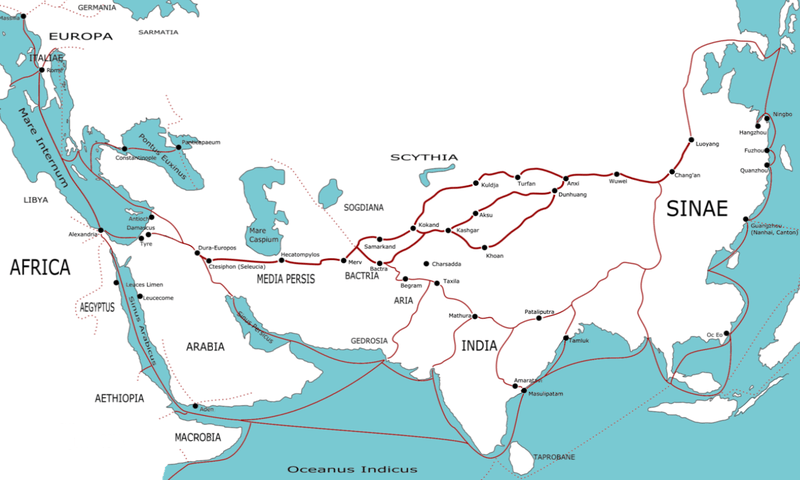 It envisions an economic cooperation bloc through to the Mediterranean that revives the old Silk Road, where trade helped developed civilizations along the route. “Previously, China focused on attracting foreign investment, but now the shift is being made — China’s more and more encouraging its capital to go abroad,” said Feng Yujun, senior researcher at theChina Institutes of Contemporary International Relations in Beijing. Xi’s overseas push comes as he tries to shape China as a great power, restoring its maritime dominance in the Asia-Pacific and extending its political and economic influence across the region, where it has been asserting itself in territorial spats. Next week, Xi will reinforce the image as he hosts U.S. President Barack Obamaand other world leaders at the Asia Pacific Economic Cooperation summit in Beijing. The State Council Information Office didn’t immediately respond to faxed questions seeking comment. The fund will finance domestic infrastructure construction and will be overseen by Chinese policy banks such as China Development Bank, the officials said. Financing will be limited to regions in the plan: Central Asia, the Middle East, South Asia, Southeast Asia and parts of Europe, they said. The plan signals “a shift in China’s strategic thought,” said Zhang Yunling, director of the Institute of Asia-Pacific Studies at theChinese Academy of Social Sciences. The past three decades of China’s development have been focused on “absorbing foreign investment” and the next step will be about the outflow of Chinese development to its neighbors, he said. The proposal has inspired competition between officials from Chinese provinces, especially the poorer western regions, seeking to tap the funding. Vice premier Wang Yang said in September in Urumqi, the capital of the western Xinjiang region, that it had a “prominent role to play” in the economic belt and the central government “supports Xinjiang to seize the historical opportunity” to become the hub of the belt. The southern province of Guangdong, a manufacturing center that helped power China’s economic rise over the past three decades, in early November hosted the inaugural international expo for the maritime Silk Road, with 42 countries participating. “One of the most important considerations in the strategy is its attempt to reduce the imbalance between the eastern coastal areas and the western inland areas,” Feng said. Xi, who has said his home province Shaanxi was the starting point for the old Silk Road, has recently ramped up efforts to sell his strategy overseas. During state visits in September he secured verbal commitments from three countries along the routes — Tajikistan, the Maldives and Sri Lanka. India has also shown interest and Afghanistan’s new president Ashraf Ghani Ahmadzai said at his summit with Xi in last week that his country was keen to be involved, according to the official Xinhua News Agency. According to a map published on the website of the official Xinhua News Agency in May, the land-based Silk Road starts from the ancient capital city of Xi’an, stretching west through Lanzhou and Urumqi before running southwest across Central Asia, the Middle East and Europe. The sea-based Maritime Silk Road goes through Guangdong and the southernmost Chinese province of Hainan, an island, en route to the Malacca Strait and Indian Ocean. It traverses the Horn ofAfrica before entering the Red Sea and Mediterranean. The two roads are supposed to meet in Venice. Once complete, the Silk Roads will bring “new opportunities and a new future to China and every country along the road that it is seeking to develop,” according to the Xinhua article.